Based on HOFFMANN’s fairy tale “The Nutcracker and the Mouse King” the NUTCRAKER Ballet originated in l816, when IVAN VSEVOLOZHSKY, the director of the Imperial Theatres in St. Petersburg, selected HOFFMANN’s story for his new ballet, composer TCHAIKOWSKY to compose the music for the ballet, and choreographer PETIPA to adapt HOFFMANN's story to the requirements of a dance. 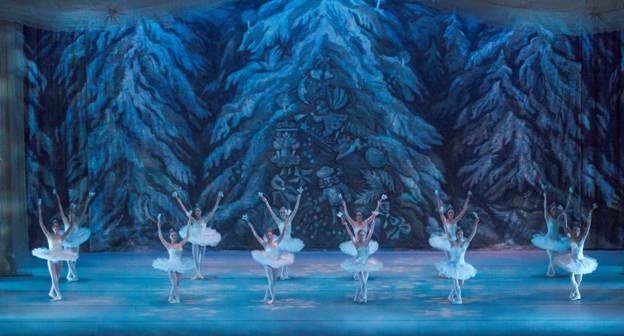 The first NUTCRACKER was performed on December 18, l892 at the Mariinsky Theatre in San Petersburg. Russia. 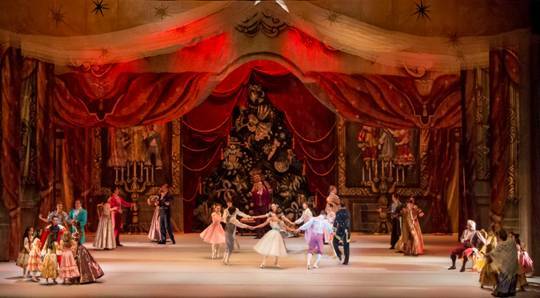 The dancers in the principal roles on Saturday night (12-16) were: EKATERINA BORTYAKOVA as Marie, ANDREY BOLOTIN as the prince, VITALY ZABELIN as Drosselmeyer and VLADIMIR YAKOVLEV as the Mouse King. 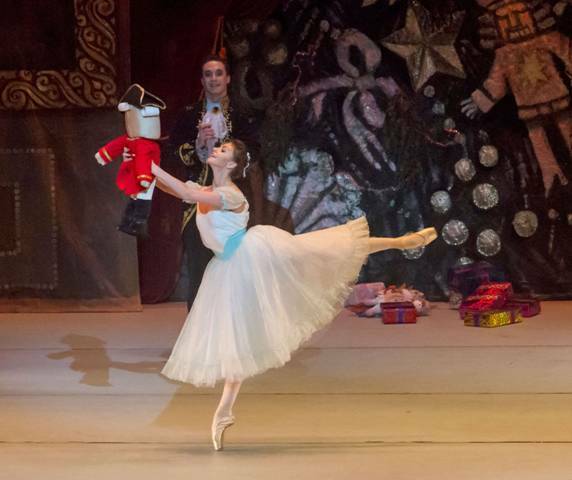 Under the Artistic Direction of MIKAIL BESSMERTNOV, the story danced by the BALLET STARS of MOSCOW, is slightly different that the story of other NUTCRACKERS. Their story also enhances the dance roles of the dancers dancing the roles Drosselmayer and the Mouse King. In the first act, of the STAR OF MOSCOW's ballet, Drosselmeyer (ZABELIN) enters the party dressed in black with a purple cape. He does several dances: he has a solo dance, he dances with Marie, and he dances with the guests. As part of his role, he also displays his "gifts" to the children, which include a dancing doll, a mavr and an harlequin. At the end of the toys' performance, he shows the children a puppet show in his Gignol theater (a small portable theatre) where the plot of the story in this ballet is not clear. Drosselmayer appears again in the second act in scenes with Marie and the Prince. Another difference in the story is that in this ballet the Mouse King (MIKHAILOV) is not killed in the first act, but re-appears in the second act when Marie is traveling with the Prince, and is killed in a sword fight with the prince. This ballet leaves unclear the reason why the nutcracker doll turned into human in the first act, BEFORE the King Mouse died and the enchantment that had turned the prince into a wooden doll has been broken. For those of us who have seen many previous versions of the NUTCRACKER, the “BALLET STARS OF MOSCOW’s scenography of the ballet, was disappointing. With the exception of a Back Drop representing Marie’ s house living room during the party, and another back drop showing large trees covered by snow, most of the dances were danced in front of a single Back Drop: cream-colored with large blue flowers. The single Back Drop was also used in the second act for the international dances so neither Arabia, Spain, Russia or China, the countries that Marie visited with the prince, were provided with a visual identification. In its effects, this ballet lacked “magic.” There was no “special effect” when the nutcracker doll became a living human being, and the Christmas tree “effect” raising higher and higher lacked imagination. In his choreography of the ballet, VASILY VAINONE, had no action during a good part of the long overture. Close to its end, however, he added people walking dressed as the guests arriving to the party. At the party, his choreography of all the assemble dances in the first act: the Walz, the children rounds, the Trepak (Russian dance) the Quadrille, The march of the soldiers” was creative and all the dances were perfectly synchronized. Visually, in the second act, The Waltz of the Flowers” looked beautiful, but the choreography failed to captivate the audience when all the dancers of the different countries were placed together forming a round and their Arabian, Spanish, Russian and Chinese dances were not only very short but danced as pas de deux by couples. In most NUT CRACKERS these dances are danced by groups.